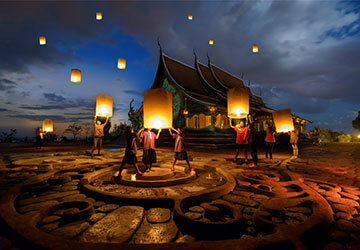 Most exclusive trip of Thailand which gives you the endless amount of histories and cultures. Numbers of country’s marvelous temples will be visited. Journey to the jungle and hidden tribal village in the north. The dates are flexible depending on your flight. Your arrival date in Bangkok will be day 1 in the itinerary and your departure from Bangkok will be day 10. If you want to prolong your stay, please contact us. Arrive in Bangkok and transfer to the city (Dinner). Boat trip on “Klongs”, famous canals of Bangkok, discover the daily life of the local population. Driven by a ceaseless turmoil, the Thai capital will reveal a face of infinity. Stop and discover the Wat Arun by the river (or Temple of Dawn) .Depart for the market of Damnoen Saduak (Floating Market). A unique discovery that will capture the best of the atmosphere of the most authentic floating market in Thailand boat ride along the Grand Canal to meet these sellers of tropical fruits and other delights. 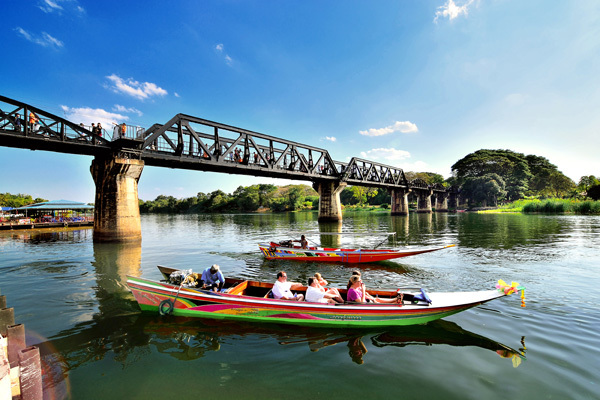 Drive to Kanchanaburi, the golden city located west of Bangkok. Visit the museum of the JEATH War. Free time for a walk on the Bridge on the River Kwai. Discover waterfalls Sai Yok Noi then boarding the "Death Railway". A picturesque route between Kanchanaburi and Nam Tok, punctuated by beautiful landscapes. Over night at Kanchanaburi (Breakfast, Lunch, Dinner included). Visit the extraordinary royal city with palaces and principal temples. Gilding, sparkling tiles and Buddha statues adorn the architectural ensemble. Discover the treasure of the Thai art par excellence Wat Phra Kaew, which houses the Emerald Buddha. Continuation with the visit of the Royal Pantheon, the library, the Phra Si Ratana Chedi covered with remarkable golden leaves. Depart for Bang Pa In, the summer residence of the kings of Siam and Thai style pavilion located in the middle of a lake. Continue to Ayutthaya, the former capital of the Kings of Siam. Visit the ruins of Ayutthaya with its main monuments: Wat Mahathat, Wat Phra Sri Samphet, Wat Ratchaburana. Overnight at Ayutthaya (Breakfast, Lunch, Dinner included). Departure for Lopburi site inhabited since prehistoric times and that has long suffered the influence of Khmer Angkor empire. Visiting San Phra Kan (temple of monkeys) place renowned for his troop of mischievous monkeys. Dinner and overnight in Phitsanulok (Breakfast, Lunch, Dinner included). City tour and stop at the local manufactures bronze Buddha statues. Depart for Sukhothai, one of those rare places in the surreal and sublime beauty. 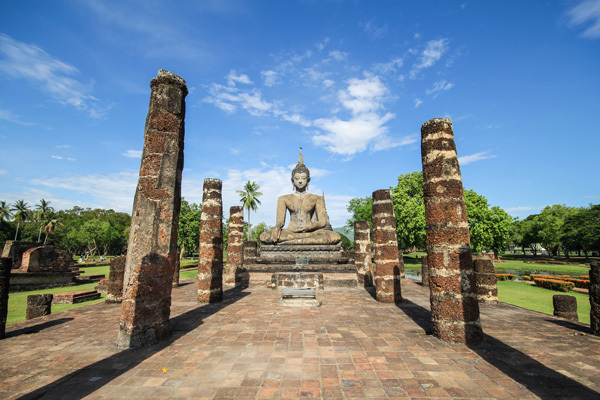 Visit Sukhothai historical park (UNESCO world heritage site) temples : Wat Mahathat, Wat Sa Sri , Wat Si Chum and Wat Si Sawai. Continue to Phrae. Visit the Temple of Phra That Cho Hae, the most revered in the region. At Phrae, enjoy a trishaw ride to discover the city. Dinner and overnight at Phrae (Breakfast, Lunch, Dinner included). Visit a Thai house made of teak "Baan Jai Prathup" and departure to Chiang Rai. Discovery of a pineapple plantation. Arriving at the edge of the Kok River and embark on canoes to explore the Karen people. 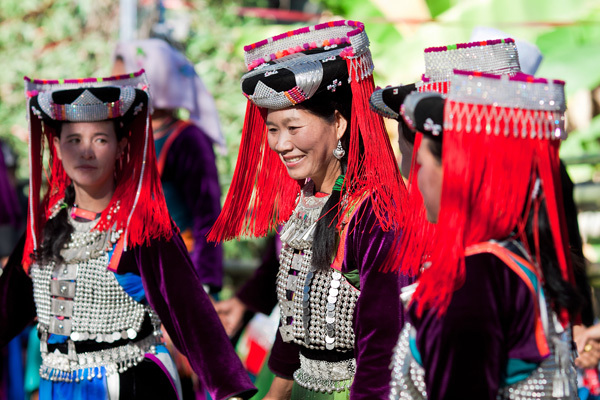 The lifestyle and customs of Karens are essentially the result of their nomadic origins and beliefs of their base, the agricultural life and traditional weaving are the heart of the activity of the villagers. Dinner and overnight in Chiang Rai (Breakfast, Lunch, Dinner included). Departure to Mae Chan and meeting with Yao and Akha tribes. 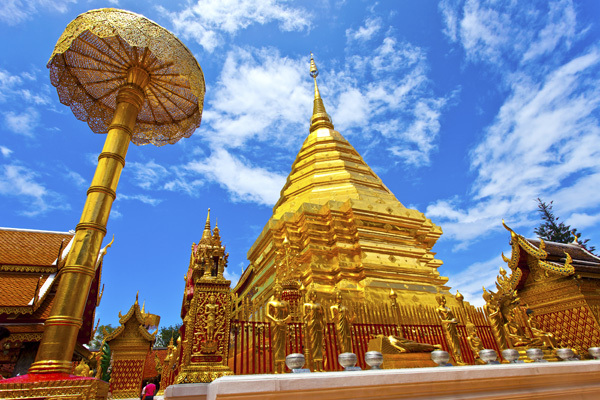 Drive to Chiang Saen and ride on the Mekong River to the Golden Triangle on the borders of Thailand, Laos and Myanmar. Visit the Opium Museum, the monastery Doitung and the Royal Palace. Stop at Wat Rong Khun (known as the white temple) and visit this temple work made by a renowned Thai artist. After dinner, visit the famous Chiang Mai night bazaar (night market). (Breakfast, Lunch, Dinner included). Overnight at hotel (Chiang Mai). (Breakfast, Lunch, Dinner included). Depart for Lampang. Enjoy local market in Lampang. Transfer to Lampang Train station and departure by night train (2nd class with air condition). Dinner box and overnight on board. (Breakfast, Lunch, Dinner included).